On King! On you huskies! 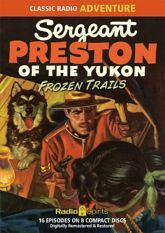 From out of the ice and snow of the Great Northwest comes Sergeant Preston of the Yukon! Paul Sutton stars in this whip-cracking collection of fast-moving tales, from the same creative team that brought you The Lone Ranger! Join Preston and King for arctic adventures on frozen trails through sixteen rare digitally restored and remastered "lost" episodes from the winter of 1952-1953.